CUSTOM, HAND-CRAFTED KEITH ROSCOE "BUCKY"
I have the tendency to break the occasional string when playing “live” and I decided to have a second “twin” built to the birds eye maple Roscoe bass I own. Since I was using the V-Bass "live" I needed a bass that was outfitted basically the same as the original birds eye maple Roscoe bass. This bass was custom made also by Keith, with identical features, with the exception of the highly figured buckeye burl top on this one. This time when I visited North Carolina to pick out the wood, I brought my camera. It was around this time that I realized how fun and entertaining it could be to document the building process involved in creating these incredible instruments. 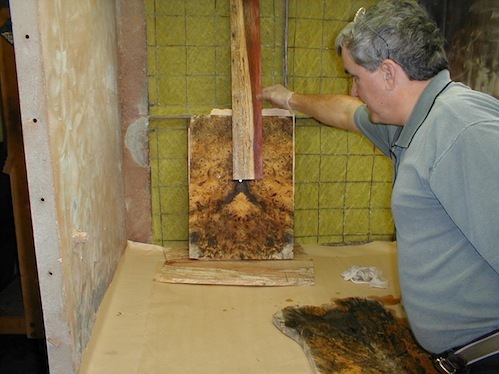 Here is a shot of the wood we picked out - Keith put the wood in his paint booth and has rubbed some water on it to simulate how it might look when the finish was applied. 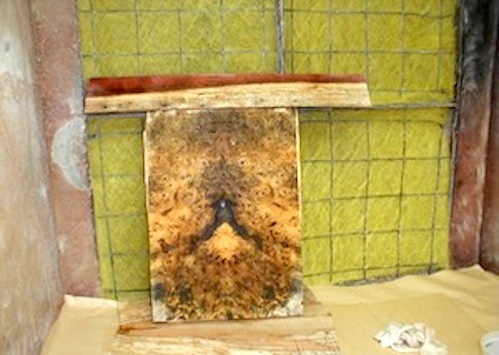 The fingerboard is sitting on top of the buckeye burl I had chosen for the top. In this shot, Keith is holding the fingerboard in an upright position to see how it might look next to the body wood. You can see the runner up choice laying on the floor of the spray booth but it was truthfully no contest. 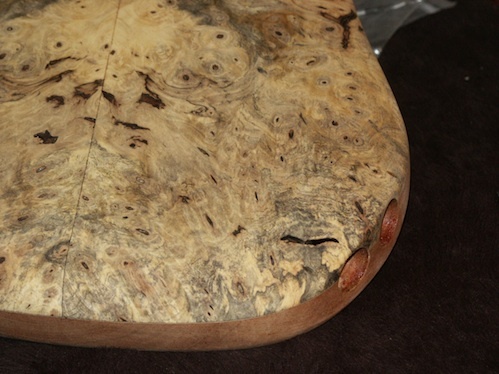 I think the buckeye burl top on this bass is some of the most remarkable wood I have ever seen. Here is a shot of the body, after being glued up with the spanish cedar and carved to Roscoe shape. Below you can see a shot of the holes for the standard and the 13 pin jack. 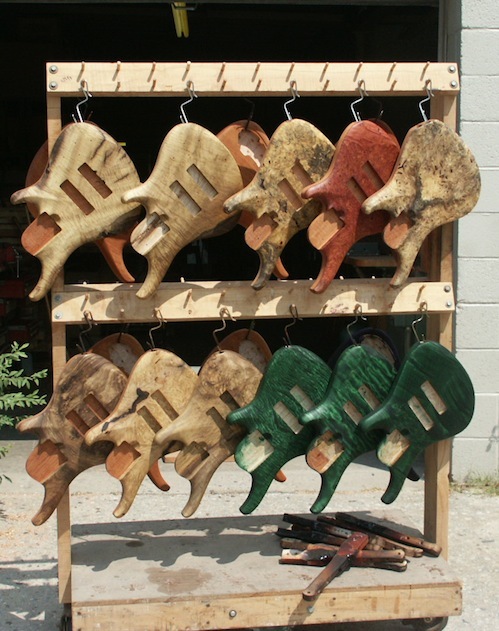 Here is the Roscoe "finish rack" you can see my beauty at the top right, funny - the only one with no pickup routings. What a difference! With the exception of the wood used on the tops, all other features are identical on both instruments except Keith may have lost the template, as the medium scale head stock on the buckeye burl bass is noticeably taller than the original one. Also, the neck is wider at the nut on this one, a full 46mm, so the neck feel on the two basses differs subtly - the birdseye is a J-Bass feel and this one is more like a P-Bass feel. Both of the Roscoes are incredibly stable, well balanced, have incredible sustain and are a delight to hold and play. I do worry about taking such incredibly fine and beautiful instruments on the road, but I have learned to live with it. I got a nice Reunion Blues leather double bass bag for the twins and it doesn't leave my sight when I am on the road. This bass is also the stuff that legends are made of. It is a custom Keith Roscoe LG 3000, fretted four-string bass with a medium 32" scale neck. This bass weighs in at 7 lbs and the width of the neck at the nut is a wide 46mm. 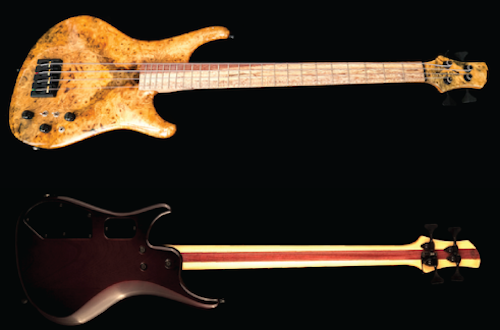 It features a laminated maple/purple heartwood neck, with Keith's amazingly stable patented truss rod design. It also features a spalted purple heart fingerboard with a distinctive diagonal “chocolate but mostly vanilla” stripe. The neck is attached with the custom Roscoe three-bolt design. The tuners, the drop "D" tuner and the custom Roscoe bridge, all in black are by Hipshot. There are red LCD micro lights on the side of the fingerboard, acting as fingerboard dots - with an on and off switch located on the body. It also has a proprietary 13-pin output jack which can drive a number of midi controllers made by Roland, Axon and other manufacturers. The piezo/midi systems is by Richard McLish and his RMC Designs. The body is a light, dry spanish cedar, a wood used prominently in making high end cigar humidors, and sports a highly figured buckeye burl top. The same buck eye burl adorns the front of the head stock The top is finished in very slightly tinted vintage amber while the back of the body is finished in a dark cherry red to match the heartwood stripe - which adorns the center of the back of the neck. The body and the front of the head stock are finished in a mirror-like gloss while the neck itself is satin. This bass is very light due to the lack of density in the buckeye burl. This bass and the birds eye Roscoe bass I own are the basses that you hear on the most recent Happy the Man CD "The Muse Awakens". For more information on Roscoe Guitars, please go here. Unique Features: Switchable LED Lights which light up the dots on the side of the fingerboard in red, drop “D” Hipshot tuner on the E String.